For more than 30 years, the attorneys at Schochor, Federico and Staton, P.A., have held health care providers accountable for falling below the acceptable standards of care. The legal team represents clients throughout Maryland, Baltimore, and Washington, D.C., as well as Silver Spring, Upper Marlboro, Rockville, Greenbelt, Annapolis and Columbia. 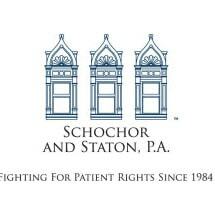 Schochor, Federico and Staton, P.A., possesses the resources necessary to take on the most complex medical malpractice cases, including class-action lawsuits. Our lawyers have succeeded in getting results on behalf of our clients suffering injuries because of negligent doctors, nurses and technicians. We collaborate with medical practitioners to gain insight into the cause of injuries and in-depth experience into these types of medical negligence cases. Simply stated, our attorneys, medical investigators and staff "speak doctor." In addition to those accolades, Founding Partner Philip C. Federico was named the 2014 Baltimore Medical Malpractice Law – Plaintiffs “Lawyer of the Year” by Best Lawyers. The selection was the second in as many years for our firm with Kerry D. Staton recognized as “Lawyer of the Year” in 2013. Jonathan Schochor was named Plaintiffs “Lawyer of the Year” by Best Lawyers for 2016. At our law office, we even the odds for medical malpractice victims and their families in taking on specific health care providers, along with the big hospitals, nursing homes and other medical facilities.